I got the box in the mail and instantly couldn’t wait to try it. 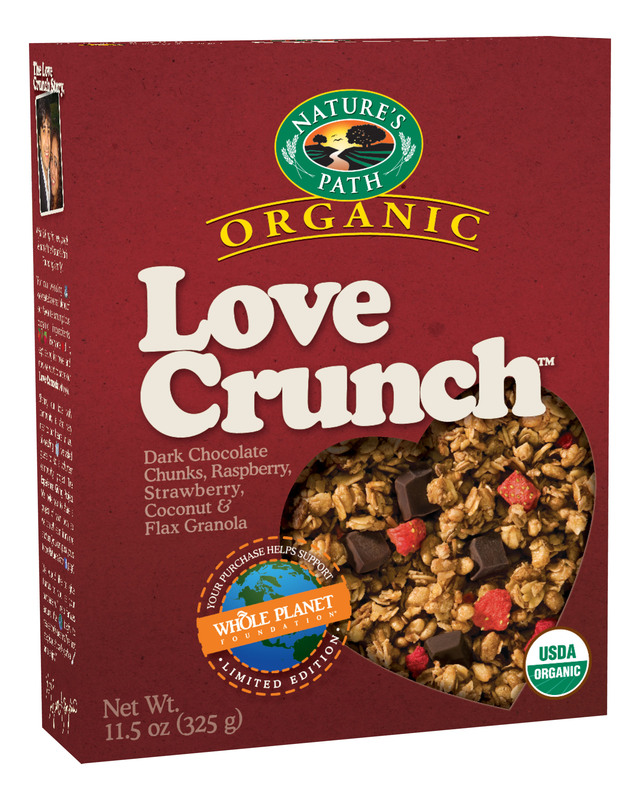 A granola with dark chocolate chunks and fruit- what’s not to like? According to the box, there is also coconut and flax in this granola, which I certainly didn’t mind either. I opened up the box and was a tad disappointed. Not as many dark chocolate chunks or freeze dried raspberries/ strawberries as I wanted or was hoping for. In fact, there really wasn’t a lot at all! Anyway, I tried the granola first. It was crunchy and sweet, with a coconut and a slight chocolatey taste- really good actually. I found a dark chocolate chunk which I actually thought was very tasty, and I’m not even a *huge* dark chocolate fan. It was slightly bitter, but very smooth and quite sweet as well. There were very sporadic pieces of freeze dried fruit, and when I tried a freeze dried piece of strawberry I was surprised that it was crunchy! Usually freeze-dried fruit for me is rather soft, but these were a nice twist! Overall, really good! I ate it right out of the box, but I’m sure it can be enjoyed a bunch of other ways as well! I think with some fruit and yogurt it could be a very delicious breakfast : ) I just wish there was more yummy strawberries and dark chocolate chunks! 4 stars. 3/4 cup is 260 calories, 9 grams of fat, 38 grams of carbohydrates, 4 grams of fiber, 10 grams of sugar and 5 grams of protein. 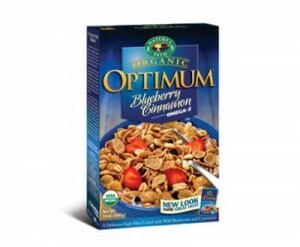 Time for another cereal/breakfast related giveaway…. my favorite! Today I’m reviewing a box of granola from Nature’s Path- the Organic PomegranPlus Granola with Cherries! This sounded so good to me before I opened the box. I was picturing a fruity, sweet yet tart granola with a bunch of cherries and whatnot. However, here’s what I got when I opened the box. As you can see, quite a bit of granola, not that many cherries. I think I found 5 in the entire box, about the size of a pencil eraser each. So that was disappointing. The few cherries that I did have were sweet and chewy. Throughout my box I even got a random flake in it which I actually found quite funny, what are YOU doing here I thought. Overall, 2 1/2 stars. 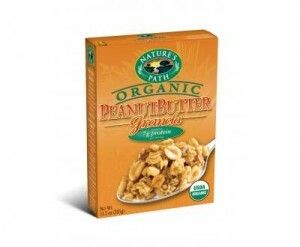 I do like that it was organic, had big clusters, and that the serving size is 3/4 of a cup for 250 calories. I just overall found it quite off, and quite bland. Certainly not one I would eat from the box, but perhaps with a flavored yogurt would be good. 3/4 cup is 250 calories, 9 grams of fat, 38 grams of carbohydrates, 4 grams of fiber, 13 grams of sugar and 5 grams of protein. 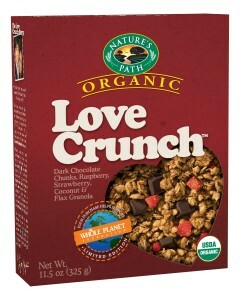 I received this box of granola from Nature’s Path for free. Nothing like a cold bowl of crunchy cereal in the morning. In fact, I find myself having cereal and fruit with almond milk almost every day of the week! Satisfying, crunchy, and just plain good! I happen to love when cereals have little add-ins to them, like granola clusters, dried fruit, marshmallows…(gotta love the marshmallows! ), so I thought Nature’s Path Organic Flax Plus Red Berry Crunch actually looked pretty good. I opened up the box and saw flakes, little balls that resembled crisp rice, granola clusters with flaxseed, and dried strawberries. According to the ingredients, there were supposed to be dried raspberries as well, but I could only really distinguish the strawberries (which were rather small, as well). I decided to try each of these components separately, and then together. The flakes were the best part. Crunchy and sweet, with a strawberry aftertaste that was quite delicious. 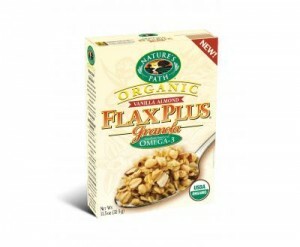 The granola clusters were crunchy, but had an overall flaxseed flavor that I wasn’t too fond of, only because while I do eat flaxseed for the nutritional benefits, I’m not a fan of the flavor of flaxseed. Next up, the strawberries, they were a tad bit small, not real “chunks” of strawberries, and were rather tart. 3/4 cup is 210 calories, 3.5 grams of fat, 39 grams of carbohydrates, 5 grams of fiber, 10 grams of sugar, and 6 grams of protein. Halloween is right around the corner- what kind of treat are you going to hand out? How about instead of candy this year, a Treat Size Envirokidz Peanut Choco Drizzle bar from Nature’s Path? These little bars are adorable, and a great option other than candy bars. Not only are they organic, but they are gluten free, too! 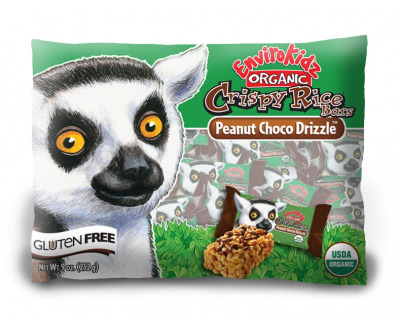 They feature an adorable Lemur on the front of the package, and are about the size of a standard fun-sized candy bar (or about the size of my palm). They are tasty too! A sweet peanut buttery base, topped with a perfect drizzle of chocolate. No joke- the drizzle on top was so pretty and perfectly organized! They have tiny peanuts in them too which add a nice touch- delicious! I’ll take these over candy any day ! 1 bar is also pretty good nutritionally. A 14-gram bar is 60 calories, 2 grams of fat, 9 grams of carbohydrates, 1 gram of fiber, 4 grams of sugar, and 1 gram of protein. 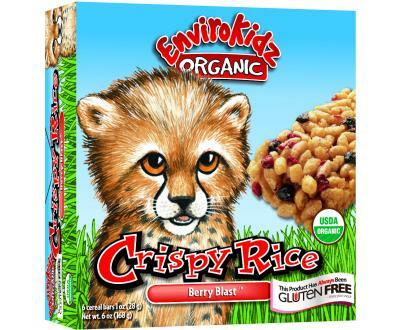 I also found out from the back of the Berry Blast bar’s packaging that “1% of EnviroKidz sales are donated to conservation groups like Wildlife Trust”. That’s awesome! A good sized bar, pale in color, and looks like a ton of pieces of puffed rice with few sporadic blueberries and red berries (which after looking at the ingredients, I found out were raspberries). The bar smells sweet- fruity and marshmallow-y (if that’s word..) at the same time. 1 bar (28 grams) is 110 calories, 3 grams of fat, 21 grams of carbohydrates, 1 gram of fiber, 7 grams of sugar, 1 gram of protein. 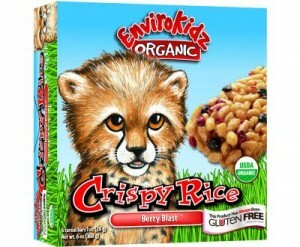 Organic Brown Rice Flour, Organic Brown Rice Syrup, Organic Honey, Organic Soy Oil, Organic Invert Cane Syrup, Organic Evaporated Cane Juice, Organic Corn Starch, Organic Acacia Gum, Organic freeze-dried raspberries, Organic freeze-dried blueberries, Natural Marshmallow Flavor (gelatin-free), Sea Salt, Organic Molasses, Natural blueberry Flavor. 1 bar (28 grams) has 120 calories, 4.5 grams of fat, 18 grams of carbohydrates, 1 gram of fiber, 8 grams of sugar and 2 grams of protein. 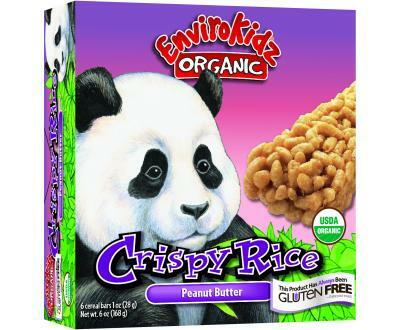 Seeing as I really enjoyed the Nature’s Path Peanut Butter Panda Puffs, I was sure I would like the Peanut Butter Crispy Rice Bar that I was sent to try as well! There’s yet another cute panda on the package of the bar, which made me feel like a kid all over again =) . The organic bar is also gluten free. 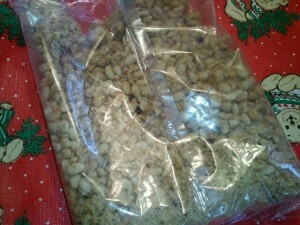 I opened up the package, and saw a brown colored bar, and a lot fo pieces that resembled puffed rice. The bar was a bit sticky, and held together quite easily. It was soft, airy, and chewy, and not too salty tasting. It didn’t really have a savory peanut butter flavor, but kind of reminded me of a sweet peanut butter flavor, rather than the type I would eat from the jar. There was also a slight molasses flavor. Overall, I would give this 3 1/2 stars. I consider it a rather light snack by itself, and think it would be good for those days I might not be hungry, but want something to eat. I do like that it’s organic, gluten free, and a decently sized bar for only 110 calories! 1 bar (28 grams) is 110 calories, 3 grams of fat, 20 grams of cabohydrates, 1 gram of fiber, 7 grams of sugar and 2 grams of protein. Organic Brown Rice Flour, Organic Brown Rice Syrup, Organic Honey, Organic Peanut Butter, Organic Invert Cane Juice, Organic Evaporated Cane Juice, Organic Soy Oil, Organic Acacia Gum, Sea Salt, Organic Molasses. GRANOLA! One of my favorite things to eat (which if you are an avid read, I’m sure you know that already! 🙂 ). So I opened up the bag, and discovered a lot of rolled oats, a good amount of tiny flaxseeds, and little slivers of almonds. This looks pretty good! I took a handful and discovered that this granola had a light vanilla flavor. Really quite light actually. I sort of wish that it had a deeper vanilla flavor, as I certainly am a fan of vanilla! I also discovered that it had a very mild sweetness- so I did actually wish it was a little bit sweeter as well. 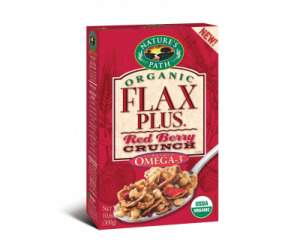 What I did like about this cereal was that according to the box, it was an “excellent source of Omega-3” and “Contains 0.9 g of Omega 3 per serving, which is 69% of the reccommended daily value of 1.3 g”. That’s really awesome! I know sometimes it’s hard for me to get all of my daily reccomended value of Omega 3’s, so this may be a good option for me! 3/4 cup is 250 calories, 9 grams of fat, 36 grams of carbohydrates, 10 grams of sugar, and 6 grams of protein. Organic rolled oats, organic evaporated cane juice, organic soy oil, organic brown rice flour, organic flaxseed, organic almonds, organic oat syrup solids (organic oat syrup solids, tocopherols), natural vanilla flavor, sea salt, organic molasses. 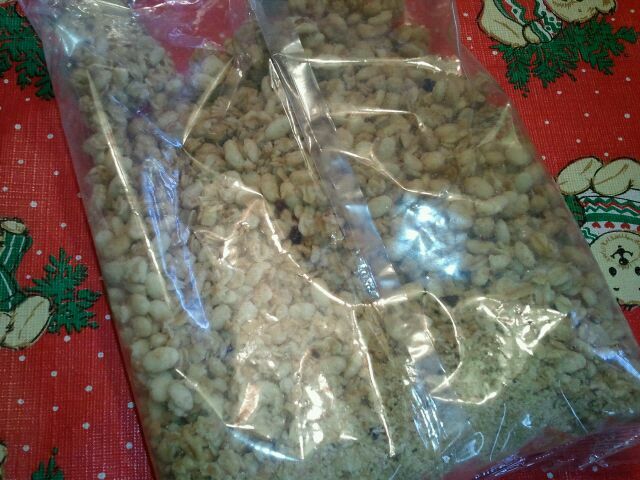 The granola itself is softer than what I am used to, but still crunchy. There are also little peanuts scattered throughout the box, which I found quite enjoyable. It really added to the overall DELICIOUS, rich, and just a tad bit sweet peanut butter flavor this granola provided. What really made me fall in love was that I got some “peanut butter chunks” in my box- as in melt-in-my mouth, soft, peanut buttery GOODNESS! They were quite big, too, and absolutely delicious. I was actually upset that there were only a few in the box, it was the best part! 3/4 cup (55 grams) is 260 calories, 11 grams of fat, 35 grams of carbohydrates, 4 grams of fiber, 9 grams of sugar, and 7 grams of protein. Organic rolled oats, organic evaporated cane juice, organic soy oil, organic peanut butter, organic brown rice flour, organic roasted peanuts, organic oat syrup solids, sea salt, tocopherols (natural Vitamin E), organic molasses, organic rice bran extract.